Fremont vs. Mexico. It’s a rivalry as old as time itself. * – Some, or all, of this may or may not be true. We thought our battled with Mexico were over. However, we knew deep down that it was only a matter of time before they were back. Earlier this year, the folks at Fremont Outdoor Movies and the Seattle Zombie Walk gathered over 4,000 zombies in the streets of Fremont in order to break the Guinness World Record for Largest Gathering of Zombies. This past Saturday, Mexico struck back and over 10,000 zombies gathered in Mexico City, shattering the record and declaring vengeance on Fremont. And so, the bloody gauntlet has been laid down. It’s up to the folks back here in Fremont to figure out a way to get 10,000+ zombies into Fremont next year if they want a chance at reclaiming the record. If you thought 4K zombies was too much, gird your loins. Literally. Next time you see a zombie on the streets of Fremont, don’t worry, Midwestern tourists aren’t on the rise. It’s just the Red, White and Dead Zombie Walk clean-up crew making the rounds. The next scheduled clean-up is September 10th weekend. Don’t worry about the zombies scaring your kids or eating delicate body parts, they’re just trying to have some fun and keep the neighborhood clean. And eat brains. Obviously. 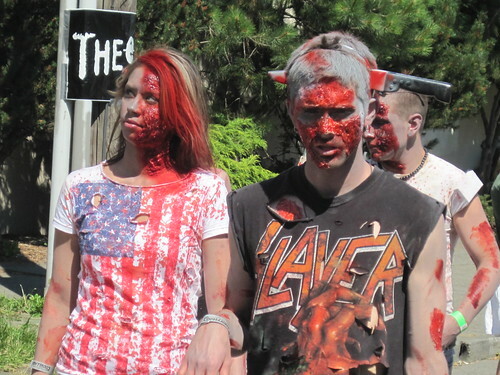 Here’s some videos from Saturday’s record-breaking Zombie gathering and walk through Fremont. Check out videos of the Thriller dance, the walk though Fremont and the cutest little zombie you’ll ever find. Congrats, everyone. You stayed alive after yesterday’s zombie infestation. And you did it while the Guinness World Record for Gathering of Zombies was being broken. According to organizers, 4,522 zombies shuffled into Fremont yesterday, devouring the previous record of 4,093. Congrats to the organizers, who busted their butts (and delicious brains) to make it happen. More photos from the day below (Part I of our photos here). These pics are courtesy of Tom Wright Photography. IF you have some photos you’d like to share, send them our way and we’ll post as well. Well, if you’ve been in Fremont today, you already know that the neighborhood is overrun by a zombie horde. All kinds of zombies have infested our little town. Scary zombies, funny zombies, bloody zombies, bride zombies, little zombies, cheerleader zombies, futuristic zombies, Victorian zombies and I think I even saw a He-Man zombie. Here’s a couple photos from the quiet before the storm when the zombies started lining up around 4pm. Plenty more photos from the day to come. Reposted: If you haven’t already made a run to Stoneway Hardware to pick up some supplies to barricade your house or apartment, now would be the time. Make sure you get plenty of wood planks to reinforce your doors & windows. Have plenty of shovels and pickaxes handy as multi-purpose tools. Non-perishable goods are always in season. And whatever you do, have an escape route in mind. 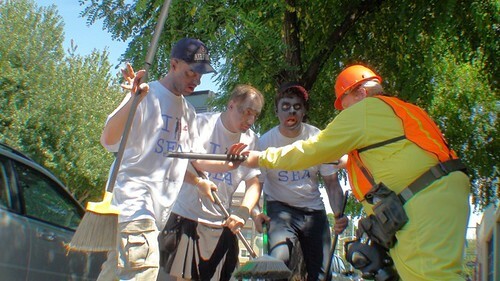 This Fourth of July weekend, thousands of Seattle’s undead return to feed on brains, beers and mobile food to represent the Emerald City to shuffle their back into the history books to reclaim the Guinness World Record for “Largest Gathering of Zombies.” New Jersey currently holds the official record with 4,093 Zombies set back in October 2010. The only way to avoid being consumed by the undead…join the fun and dress up like one as well. If you want to help break the record, 4,095 zombies must be present at Fremont Studios (3501 Phinney Ave.) on Saturday, July 2nd, 2011 starting at 2pm. Along with the Zombie Walk, there will also be a concert featuring Kultur Shock and The Staxx Brothers (obviously both your mother’s favorite bands). Get your drink on at the Beer Garden (proceeds benefit Fremont Arts Council) and get your non-brains-related eat on at one of the 10 food trucks that will be on hand. If you don’t know where to go, just follow the trail of human limbs. Or signs. Probably the signs would be better. And more sanitary. Just because you don’t know how to zombify yourself is no excuse. Get your make-up done by professionals for $5 if you need a quick fix or $10 for the full costume. Come early and head to the front entrance to get done up. Full details can be found at two websites Fremont Outdoor Movies or ZomBcon for the full lineup of events and activities. Tickets are available for only $3 single or $5 for two people until June 25th at www.strangertickets.com. That’s the exact number of zombies that are going to be needed to break the Guinness World Record for Largest Gathering of Zombies. That’s also around the number of zombies that will be crawling, moaning and lurching into Fremont on Saturday, July 2nd. The Fremont Outdoor Movies & Seattle Zombie Walk is coming and the undead masses are coming with it. 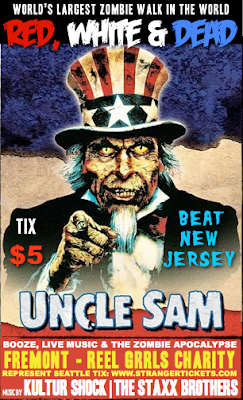 Their goal, besides chowing down on some delicious (and hopefully organic, non-GMO) brains, is to regain that world record, currently owned by New Jersey (the entire state gets the record? 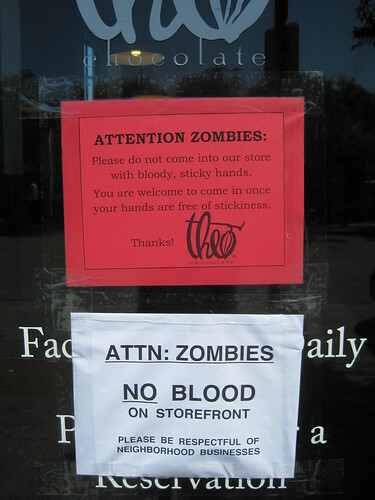 ), who saw 4,093 zombies gather in October 2010. Of course, these zombies might wander aimlessly, but don’t tell them they lack purpose. The goal of the Zombie Walk, besides breaking records, is to raises some money for the Fremont Arts Council. Full details can be found at Fremont Outdoor Movies or visit ZomBcon for the full lineup of events and activities. Tickets are available for only $3 per person/zombie or $5 for two people/zombies until June 25th at www.strangertickets.com. No refunds for humans who become infected with whatever mysterious virus created this zombie plague in the first place. If your brain gets devoured, that’s your own fault. UPDATE: Preliminary numbers show 4,233 zombies were in Fremont yesterday, which should break the world record of 4,026, reports KOMOnews.com. We’ve contacted Ryan Reiter at Fremont Outdoor Movies for verification, which we’ll hopefully have after the holiday. They shuffled, ambled and sometimes lunged at unsuspecting spectators. They chased zombie hunters who rationalized their attacks on them by saying, “The undead aren’t people.” They threatened to eat the living, although some chose to go vegan or organic in their dining preferences. They came caked in (fake) blood, several stages of decomposition and excelling in creativity. A lot of people have been watching a lot of zombie movies, because they were all kinds of convincing. We saw several varieties of Zombie: Stormtrooper Staked by Lightsaber, Star Trek (always the red shirts! ), Horror Movie Perfect, World Cup fan/Vuvuzela (stop blowing that damn horn! ), Baby, Prom, Village People, Killed by Golfball, Goth, Family, Office Worker, Bride, Brain Eating, Hobo Couple, etc. Zombies don’t discriminate. This is our Day of the (Un)Dead, the zombiewalk known as the Red, White & Dead event, right here in the (UnDead) Center of the Universe, Fremont. They came in droves to try to break the Guinness Book of World Records for most zombies in one location. Seattle had 3,894 zombies turn out last year for the walk to set a record, but English zombies later one-upped us with 4,026. Something about cold, wet climates bring out an infectious number of the zombie nation. They congregated on 35th Street between Phinney and 1st Avenue NW for the better part of the day, starting at noon. The actual walk did not start until after 6. Some even took coffee breaks before their big walk. They went west on 35th, turned right to go down 36th, headed toward the Fremont Bridge on Fremont Avenue, and then looped around on 34th. They followed Zombie Captains who dangled body parts to lure them forward in their lumbering march. Even in their undead state, they were true Seattle zombies: they did not cross the street until the WALK sign/symbol lit up. And where there are zombies, there are a lot of zombie hunters. But they were often outnumbered, though they did manage to slow some down. Melees broke out sporadically. But more often than not, the zombies prevailed, pushing their all-too human resistance into retreat. Some humans took refuge in trees, only to find themselves surrounded! Sometimes, it really did feel like being in a zombie movie. And some came up suddenly to those of us observing, scaring us into screaming/laughing like a girl. Which I am. Zombie hecklers were also in attendance, most notably from the steps of the Red Door on 34th, a major undead watching area. Here, the zombies were judged, and sometimes, they didn’t respond so favorably! We’ll let you know if they break the world record! While the rest of the country celebrates our country’s independence this weekend, Seattle honors its dead – its walking dead – in the second annual Red, White & Dead event. Seattle can lay claim to the “Zombie Capital of the World” once and for all in the “Dead” Center of the Universe. This is your warning to NOT be freaked out by the sometimes very convincing zombies that will take over Fremont on Saturday by the thousands. Yeah, that’s right – enough for 3 “Resident Evil” movies! The goal is to outdo the Brits, who hold the zombie walk Guinness World Record through the Big Chill Music Festival in England. From noon to midnight Saturday at Fremont Outdoor Movies (3501 Phinney Ave. N.), there will be an attempt to beat Guinness Book of Records with most “zombies” in one location. 3,575 are expected, but as Pope mentioned, the record could be broken – again. 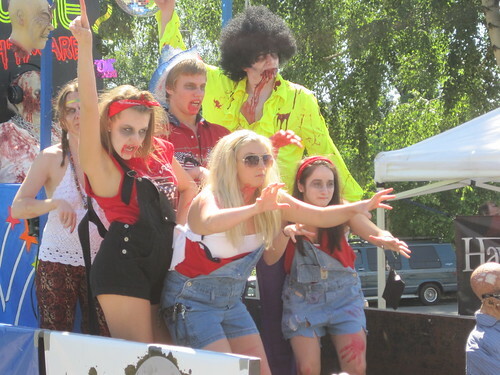 From 5 p.m. to 8 p.m., zombies will dance and walk on sidewalks in Fremont, with North 35th Street closed from Phinney Avenue North to First Avenue NW. Pre-register online for $3, or pay $5 at the door. In addition to the attempt at the record and the shuffling dancing and walking that goes with channeling zombie, this year’s festivities will also include a huge Thriller Dance, Zombie fashion show, musical performances, special guests and all time Zombie classic, George A. Romero’s DAWN OF THE DEAD. And more: a blood drive, canned food drive and a portion of the proceeds will be donated to the local non profit organization, the Seattle International Film Festival in support of their new film center that will be at the Seattle Center. This year also marks the “Year of the Zombie” and Seattle seems to be the center of attention, as 2010 marks another first for Seattle with ZomBcon, the world’s first Zombie Culture Convention infecting Seattle on Halloween weekend at the Seattle Center and Experience Music Project with over 100 Exhibitors, 10 interactive fan workshops, panels, a SIFF-curated film series, and Halloween Masquerade , Zombie Prom party. We plan to have a collection of experts, authors, filmmakers, historians, celebrities and all the gear and fan fare for the Quintessential Zombie fan. We’ll be there, and we’ll post the gruesome photos here on Fremont Universe.